Body image, self-confidence, self-awareness… all inextricably linked with health, fitness and your overall wellbeing. If you can improve the former, the latter will follow. So when the opportunity arose to be part of a project that spoke to and inspired women around the world to embrace themselves for exactly who they are…well, I had to get involved! What do you see when you look in casino online the mirror? A deceptively simple question but one that I’m willing to bet you’ve never been asked. And this is very much the idea of What I See – when you are completely honest with yourself about the aforementioned big three: body image, confidence, awareness – this self-realisation is incredibly empowering. And whilst everyone’s responses are very personal and very different, they’re also widely relatable and interconnected. I know that sounds a little contradictory but visit the What I See website and watch some of the videos – you’ll understand what I mean. So…what do I see when I look in the mirror? For the sake of the campaign, I braved my fear of video and laid out the workings of my brain for all to see. And that’s a wrap from me! Time to pass on the baton to the next What I See campaigner – head on over to Curious Fancy and find out what the lovely Ragini Nag Rao has to say about what she sees! But before you go…What do YOU see when you look in the mirror? You might surprise yourself with your answer. TrainWithCharli bumpkinbetty So are we – can’t wait to meet you! 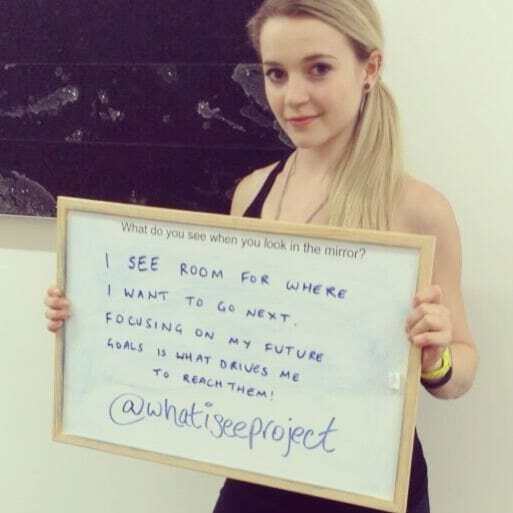 TrainWithCharli whatiseeproject me too! The planning is under way and its going to be lots of fun! !